Set of 2 decals shown above. 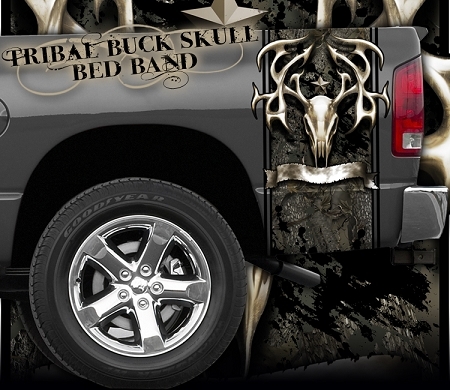 Bed bandz are an easy, inexpensive way to dress up a truck. Printed on premium 3m vinyl with tiny air-egress channels for easy, bubble-free application. Also includes glossy protective overlaminate and removable transfer-tape. Bed Bandz are not printed until your order is placed, to give you a brand new, hot-of-the-press product. Therefore, we cannot accept returns on decals and Bed Bandz. Please measure truck before ordering to ensure they are a proper fit. Bow Reaper Rear Window Decal 13"
Copyright Backwoods Brand. All Rights Reserved.